"Let me issue and control a nation's money supply, and I care not who makes its laws." Many prominent Americans such as Benjamin Franklin, Thomas Jefferson, and Andrew Jackson have argued and fought against the central banking polices used throughout Europe. A note issued by a central bank, such as the Federal Reserve Note, is bank currency. These notes are given to the government in exchange for an interest-bearing government bond. The primary means to pay for the interest on these bonds is to borrow more bank notes, thus beginning a vicious cycle that ultimately ends with the complete destruction of the currency and bankruptcy of the nation. History is replete with such occurrences. (For a list of countries that have experienced hyperinflation click here). This begs the question as to why such a doomed system would exist? The reason is that during the course of the arrangement, which can last for centuries, the central bankers who issue the money amass great fortunes from the large sums of interest collected. In essence it is a transfer of wealth from the many to the elite few. Government leaders prefer such a system because it does not require budgets to be balanced. It is far more politically expedient to borrow, then to directly tax the citizens. Throughout the history of the United States there has been a struggle between central bankers and their interest-bearing money and those who oppose them. In fact, the United States was created as a direct result of that struggle. In order to pay debts incurred from the Seven Years War with France, King George III of England sought to heavily tax the colonies in America. In 1742, the British Resumption Act required that taxes and other debts be paid in gold. As a result of scarcity of gold, the colonists turned to alternative forms of money including wampum, tobacco, and copper coins. Most silver coinage in circulation came from Spanish America, Spain, the Netherlands, the German States, France and other foreign countries. The colonies began issuing colonial script that was paper fiat currency not backed by gold or silver. This type of money was also known as colonial bills of credit. This radically differed from the bills of debit issued by the central banks of Europe. During a visit to Britain in 1763, The Bank of England asked Benjamin Franklin how he would account for the newfound prosperity in the colonies. Franklin replied. "That is simple. In the colonies we issue our own money. It is called 'Colonial Script'. We issue it in proper proportion to the demands of trade and industry to make the products pass easily from the producers to the consumers...In this manner, creating for ourselves our own paper money, we control its purchasing power, and we have no interest to pay to no one." In response, the Bank of England influenced the British Parliament to put a stop to this activity. Under the Currency Act of 1764, King George III decreed that the Colonists cease printing their own money. The colonial script in circulation was to be exchanged at a two-to-one ratio with notes drawn from the Bank of England. This caused widespread unemployment and economic depression in the colonies. Additional British legislation further angered the colonists who protested against taxation without representation. The Stamp Act of 1765 was the first direct tax levied by the British Parliament on the colonies. Every item of commerce - newspapers, almanacs, pamphlets and official documents, even decks of playing cards - were required to have the stamps. An economic boycott of British goods later led to its repeal. Increased British military presence in the colonies further reduced Colonial support towards Britain. On March 5, 1770, a large boisterous mob armed with sticks of firewood began throwing snowballs and debris at a group of British soldiers. One of the soldiers was struck down and in the confusion the British soldiers discharged their muskets into the crowd. Eleven people were hit of which three were killed instantly. Two later died from their wounds. The event became known as the Boston Massacre and was often cited and exaggerated to illicit further discontent towards the British. 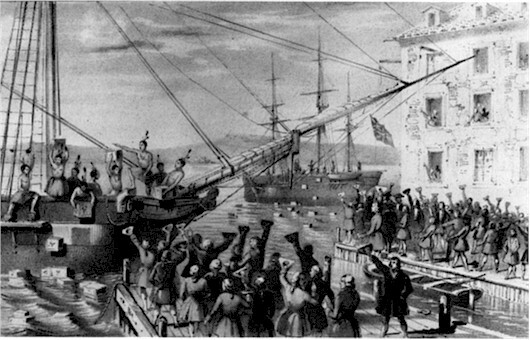 The currency restrictions, hated taxes and numerous clashes with British soldiers set the stage for the infamous Boston Tea Party. The colonists began smuggling in tea from Holland to circumvent British taxes. Under the Tea Act of 1773, the British removed a duty always paid at an English port by the tea merchant on his way from the Orient to America, thereby making their tea cheaper than that from Holland. Tea-laden ships reached Charleston, Philadelphia, New York, and Boston late in the autumn of 1773. However, the colonists felt that principles were at stake and, in defiance, refused to purchase the English tea. The only port the tea landed was Charleston where it was left to rot in storage. On December 16, 1773, a group of colonists disguised as Mohawk Indians, led by Samuel Adams, boarded the ships of British tea merchants and dumped 340 chests of tea with an estimated value of £10,000 worth into the Boston harbour. The infuriated British government responded by passing several acts that came to be known as the Intolerable Acts of 1774. These Acts included, among other measures, the Boston Port Act which closed the important port until the East India Company had been repaid for the destroyed tea and until the king was satisfied that order had been restored. The harsh measures of these Acts made it difficult for moderates within the colonies to continue supporting Britain and promoted sympathy towards Massachusetts. This resulted in the formation of the First Continental Congress. Measures discussed at this meeting included a formal agreement to boycott British goods unless the Intolerable Acts were reversed and a pledge that all colonies would support Massachusetts in case of any military action from Britain. Open hostilities began on April 19, 1775 in Middlesex County, Province of Massachusetts Bay when a British regiment was dispatched to confiscate arms and arrest revolutionaries. This sparked the beginning of the American Revolutionary War, later identified as the War of Independence. The first attempt to set up a European style central bank was the formation of the Bank of North America by Robert Morris who used gold loaned from France as a reserve deposit. Using the system of fractional reserve banking, money was loaned out to eager American political leaders who were cash-strapped from the War of Independence. Fractional reserve banking is a time-honoured tradition beginning with the English goldsmiths of 1000 A.D. The goldsmiths, who at that time functioned as early bankers, discovered that they could lend out more in paper receipts for gold than they had of the actual metal so long as the majority of depositors never asked for their gold back. Fractional reserve banking is the tolerated, and now institutionalized, practice of banks lending out money they don't have and charging interest on it. In any other industry, this would be considered fraud. (For a more in-depth discussion of Fractional Reserve banking, click here). To illustrate the process, consider a bank having $1 million in reserve deposits. Under a reserve ratio of 10%, that bank may legally lend out $10 million in loans. At a modest interest rate of 7%, this equates to an annual revenue of $700,000 from an underlying asset of just $1 million. It is through this fraudulent practice that banking is such a profitable business and why all the tallest buildings in major urban centers are owned by banks. Six years after the collapse of the Bank of North America, bankers in Europe installed a private central bank, known as the [First] Bank of the United States. The bank bill was officially proposed by Alexander Hamilton, Secretary of the Treasury, to the first session of the First Congress in 1790. Coincidently, one of Hamilton's first jobs after graduating from law school in 1782 was as an aide to Robert Morris, the head of the Bank of North America that collapsed in 1785. Secretary of State Thomas Jefferson argued that the Bank violated traditional property laws and that its relevance to constitutionally authorized powers was weak. Hamilton argued that the while the Constitution states that while no single state government can create paper currency, there is no wording preventing the federal government from doing so. In the end, George Washington signed the bank bill into law on April 25, 1791 for a 20-year charter. In the first five years of operation, the American government borrowed $8.2 million and prices rose by 72%. Twenty years later, the Democratic-Republican majority in Congress voted against renewing the Federalist conceived institution and the [First] Bank of the United States officially closed its doors on March 3, 1811. Nathan Mayer Rothschild, son of Mayer Amschel Rothschild, is claimed by some historians to have warned, "...that the United States would find itself involved in a most disastrous war if the bank's charter were not renewed." Coincidently, within five months of the closing of the [First] Bank of the United States, the British declared war allegedly financed by loans from the Rothschilds, whom at this time were already prominent bankers in Europe. The War of 1812 resulted in the first significant issue of treasury notes from the United States of America. These notes differed from bank notes because they were not exchanged for an interest-bearing government bond. The U.S. Constitution defines a difference between legal currency and bills of credit. As a result the treasury bills were not to circulate as currency and could only be issued to persons who 'may choose' to accept them. A resolution in 1814 seeking to make the treasury notes "legal tender in all debts due" was voted down 95 to 42. Some 50 years later, Congress would not demonstrate such wisdom again. With the British busy fighting Napoleon, the War of 1812 ended in a draw in 1814. Due to the costs of war, many banks had over-issued their currency from making loans to the government. In order to protect the banking industry, Congress suspended redemption of paper money in gold or silver. Instead of just keeping merely the banks solvent, this measure allowed them to further lend money. Soon the entire U.S. banking system was in chaos. The banking system would ultimately be required to honour their obligations. This would result in widespread bankruptcies, as loans would be need to be called in to cover depositor withdrawals. The most politically viable option to prevent this was to establish a central bank to function as the lender of last resort. The Second Bank of the United States was chartered in 1816 under the administration of U.S. President James Madison. It was founded with a mandate similar to that of the previous [First] Bank of the United States whose charter had expired five years prior. These mandates were to issue currency, purchase government debt, and serve as the official depository for Treasury funds. The bank was to raise $7 million in as reserves but never acquired more than $2.5 million. In 1818, the Bank had $2.36 million in reserves, and $21.8 million of notes and deposits on record giving it a reserve ratio of 0.11. Within one and half years the bank had added $19.2 million to the Nation's money supply thus sparking an economic boom. As a result of soaring prices from currency devaluation the bank became in danger of being unable to honour redemptions on its reserves. To prevent such a calamity, the bank decreased the money supply from $21.9 million to $11.5 million. The 47% reduction in money supply led to a text-book example of a deflationary bust caused by manipulation of the money supply. President Jackson was an advocate of sound monetary policies as outlined in the U.S. Constitution. He opposed the central bank system of issuing currency against debt. Jackson had an investigation done on the Second Bank of the United States which he said established "beyond question that this great and powerful institution had been actively engaged in attempting to influence the elections of the public officers by means of its money." In 1832, Andrew Jackson's re-election slogan was "JACKSON and NO BANK!" On July 10, 1832 President Jackson vetoed congress' decision to renew the charter of The Second Bank of The United States. In 1833, President Andrew Jackson instructed his Secretaries of the Treasury to cease depositing funds to the bank. Two refused to obey, so he fired them, one after the other, until he got one who did: Roger B. Taney, his former Attorney General and the future Supreme Court Chief Justice. In 1835, Jackson paid off the final instalment on the national debt. He was the first and only president to ever accomplish this. A few weeks later, Richard Lawrence tried to shoot Jackson. However, both revolvers failed and he was arrested and tried but was found not guilty by reason of insanity. Allegedly, he spoke to several friends that wealthy people in Europe had put him up to it and promised to get him released if he was caught. In order to finance the North's Civil War efforts, Lincoln approached the European banks controlled by the Rothschilds in 1861. They demanded 24% to 36% interest. Lincoln refused and instead passed the Legal Tender Act of 1862. Under this new piece of legislation, Lincoln issued US$449,338,902 of interest-free money, known as Greenbacks, so-called from the green ink they used. It served as legal tender for all debts, public and private and was used to finance the Union's Civil War efforts. By the end of 1863, Congress had authorized the printing of US$850 million worth of Greenbacks. Private banks used these Greenbacks as bank reserves, against which the issued their own bank notes and demand deposits. Over the course of the U.S. Civil War the money supply went from $45 million to $1.77 billion. Prices subsequently skyrocketed. In 1863, Congress passed the National Bank Act from which point forward, all money in circulation would be created out of debt from bankers buying U.S. government bonds in exchange for bank notes. By 1865, the national banks had 83 percent of all bank assets in the United States. Lincoln was assassinated by John Wilkes Booth on April 14, 1865, just five days after Lee surrendered to Grant. On April 12, 1866, Congress passed the Contraction Act which called for retiring Lincoln's greenbacks from circulation as soon as they came back to the Treasury in payment of taxes. Three failed attempts of establishing a central bank in the United States did not dissuade a fourth. By the beginning of the 20th century the most influential business men and bankers were the J.D. Rockefeller, J.P. Morgan, Paul Warburg, and the Rothschilds. The Panic of 1907 was a run on the American banking system as a result of a public announcement by J.P. Morgan that a prominent bank in New York was insolvent. The results were wide-spread mass withdrawals on the entire banking system. This forced the banks to call in their loans. Bankruptcies, repossessions and financial turmoil emerged. Congress created the National Monetary Commission after the Panic of 1907 to draft up a plan for banking reform. Nelson Aldrich headed the Commission that comprised of two components - one to study the European central banking systems headed by Aldrich himself and another to study the American monetary system. Centralized banking was met with much opposition from the American public, who were suspicious of a central bank and who charged that Aldrich was biased due to his close ties to wealthy bankers such as J.P. Morgan and his daughter's marriage to John D. Rockefeller, Jr. Allegedly, in exchange for financial support for his presidential campaign, Woodrow Wilson agreed that if elected, he would sign a bill that would lead to the formation of a central bank for the United States. Over a period of ten days they drafted the Federal Reserve Act that was voted on in Congress on Monday 22 December 1913 between the hours of 1:30 am to 4:30 am when much of Congress was either sleeping or at home with their families for the Christmas holidays. It passed through the Senate the following morning and Woodrow Wilson signed the bill into law later that same day at 6:02 pm. This Act transferred control of the money supply of the United States from Congress as defined in the U.S. Constitution to the private banking elite. The deceptive terminology of the name was carefully chosen because the American public did not want a central bank similar to those in Europe. The Federal Reserve is not a federal governmental entity nor is it a reserve, such as a governmental treasury, backing up its currency. The Federal Reserve is a legalized cartel of the money supply owned by private national banks, operating for the benefit of the few under the guise of protecting and promoting public interests. The meeting on Jekyll Island remained unknown to the public until Forbes magazine founder Bertie Charles Forbes wrote an article about it in 1916, three years after the Federal Reserve Act was passed. A central banking system wherein every dollar created is an instrument of debt requires the collection of large sums of money from the people to pay off the interest. Interestingly, 1913 was also the year that introduced the Sixteenth Amendment, thereby giving government the power to collect taxes based on income. In 1914, when war broke out in Europe, the American public did not want to become involved. While President Woodrow Wilson publicly declared that the United States would remain neutral, efforts were being made behind the scenes to ensure America's entry into the war. Wars are extremely profitable for central bankers because it forces the governments to further borrow addition money at interest. Secretary of State, William Jennings Bryan wrote, "the large banking interests were deeply interested in the world war because of the wide opportunities for large profits." Allegedly on May 7, 1915 the Lusitania, an ocean-liner carrying American passengers, was deliberately sent into German controlled waters. The German Imperial embassy paid to have a warning ad in fifty East Coast newspapers, including those in New York, stating that anyone boarding the Lusitania would be doing so at their own risk . The ad appeared only in the Des Moines Register. As expected, a German U-boat torpedoed the Lusitania. German records indicate that a large secondary explosion followed the torpedo hit leading some to speculate the storing of ammunition. As a result 1,198 people of the 1,959 aboard lost their lives and the U.S. shortly entered the war thereafter. The public was told that the creation of the Federal Reserve would stabilize the economy. From 1914-1919 the money supply nearly doubled. This resulted in extensive loans to small businesses and the public. A calling in of the loans in 1920 resulted wide-spread bankruptcies and bank-runs marking the steep 1920-1 recession. Over 5400 independent and competitive private banks outside of the Federal Reserve System collapsed thus consolidating the power of the central banks. The Harding administration did not intervene despite political pressure to do so. Harding's approach to the problem was, "the banks got themselves into this mess, so let them get themselves out of it." Since the Harding administration public management of the economy has emerged as a primary activity of the government. President Harding was the sixth president to die while in office. It was during his "Voyage of Understanding", during which he was returning from Alaska. The official cause of death as stated in the New York Times was, "a stroke of apoplexy". Gaston B. Means, an amateur historian and gadfly, noted in his book The Strange Death of President Harding (1930) that the circumstances surrounding his death lend themselves to speculation he had been poisoned. From 1921 to 1929 the Federal Reserve increased the money supply by 62% thus fuelling the period known as the Roaring Twenties. Further fuelling the rise in stock market indices was a new type of loan, known as a margin loan, whereby an investor would only need to put down 10% of the value of a stock with the remaining 90% being loaned from the broker. Like today, these loans could be called in at any time and had to be paid within 24 hours, known as a margin call. This is typically accomplished by the selling of the stock purchased using the loan. These two factors, loose monetary policy and easy loans resulted in a fivefold increase in the Dow Jones Industrial Average over the latter half of the 1920's. The mass calling in of these margin loans by the New York banking establishment resulted in the devastating market crashes of October of 1929. "Black Thursday", the initial crash, occurred on October 24. The crash that caused general panic five days later on October 29 was known as "Black Tuesday". Then, instead of expanding the money supply, the Federal Reserve contracted it, thereby creating the period known as the Great Depression. Congressman Wright Patman in A Primer On Money, reported that the money supply decreased by eight billion dollars from 1929 to 1933, causing 11,630 banks of the total of 26,401 in the United States to go bankrupt. This allowed central bankers to buy up rival banks and whole corporations at a deep discount. It is interesting to note that biographies of J.P. Morgan, Joe F. Kennedy, J.D. Rockefeller and Bernard Baruch indicate that they all managed to transfer their assets out of the stock market and into gold just before the crash of 1929. Legend has it that Joseph P. Kennedy decided to sell his considerable stock holdings after hearing an investment tip from a shoe-shiner. Joe Kennedy went from having $4 million in 1929 to over $100 million in 1935. On June 10, 1932, Congressman Louis McFadden, a long-time adversary to the Federal Reserve, made a 25-minute speech before the House of Representatives, in which he accused the Federal Reserve of deliberately causing the Great Depression. In 1933, McFadden introduced House Resolution No. 158, Articles of Impeachment for the Secretary of the Treasury, the Comptroller of the Currency, and the Board of Governors of the Federal Reserve, for numerous criminal acts, including but not limited to, conspiracy, fraud, unlawful conversion, and treason. Louis McFadden died in Oct 3, 1936 during a visit to New York City. The official reason of death was "heart-failure sudden-death", after a "dose" of "intestinal flu." There were previously two alleged attacks on McFadden's life. The first came in the form of two revolver shots when he was in a cab outside one of the Capitol hotels. Both shots missed their intended target. The second was when he became violently ill after a political banquet at Washington. He was saved from a physician friend at the same banquet that procured a stomach pump and gave McFadden emergency treatment. Under the pretense of helping to end the Great Depression came the 1933 Gold Seizure whereby the Roosevelt Administration outlawed private ownership of gold. Under the threat of imprisonment for 10 years, a US$10,000 fine or both, everyone in America was required to turn in all gold bullion to the U.S. Treasury. The rationale for the seizure was that the declining prices of the Great Depression were a direct result of overcapacity. This flawed reasoning resulted in the creation of disastrous policies such as National Industrial Recovery Act where business cartels were deliberately constructed to keep prices high and the Agricultural Adjustment Act that ordered mass destruction of livestock and crops in order to reduce supply and drive up prices. In a time when unemployment is at record highs and people are suffering from economic hardship, these policies are the complete opposite of what is required. As a final component to the Roosevelt Administration's desire to increase prices was to devalue the dollar. To do so required that the dollar be uncoupled from gold. 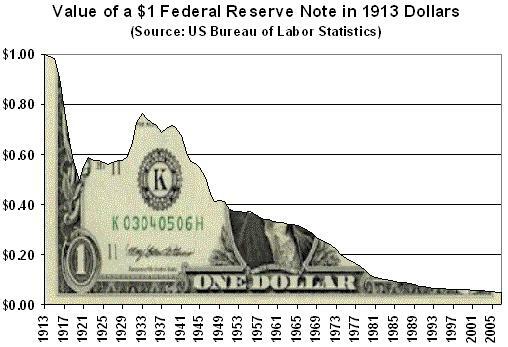 As long as the dollar was tied to a gold standard, the amount of money in circulation could not dramatically increase as the public would convert the paper into gold when they became aware of the over-issuance of paper currency. On April 5, 1933, Roosevelt signed Executive Order 6102, which ordered people to turn in their gold to the government at payment of $20.67 per ounce. Individuals could hold up to $100 in gold coins, and there were some exceptions for dental use, jewelry, and artists and others who used gold in their jobs. While U.S. citizens could be ordered not to hoard gold, Roosevelt knew he could not impose such a law on sovereign nations. Foreigners could still exchange there U.S. dollars for gold, but shortly after issuing Order 6102, Roosevelt devalued the dollar to US$35 per ounce thereby decreasing the value of the dollar overnight by 40.94%. The result of these policies allowed greater ability of the Federal Reserve to increase the amount of money in circulation thereby increasing their revenue from interest. Franklin Delano Roosevelt's uncle, Frederic A. Delano, was appointed by Woodrow Wilson to the First Federal Reserve Board on August 5, 1914. Roosevelt may have been sympathetic to the central bankers desire for American entry into the Second World War. There exists some suggestive evidence that the Roosevelt administration provoked the Japanese into attacking American forces stationed at Pearl Harbor. In 1940, FDR ordered the pacific fleet transferred from the West Coast to Hawaii. Admiral Richardson complained of inadequate protection from both air and torpedo attack. He twice disobeyed orders to berth the fleet there and was replaced by Admiral Kimmel, who later brought up the same issues. On October 7, 1940, Lieutenant Commander Arthur McCollum wrote an eight page memo describing a process to force Japan into war with the U.S.
On February 11, 1941, FDR proposed sending six cruisers and two carriers to Manila. It is generally agreed that the U.S. oil embargo on Japan lead promptly to the Japanese invasion of the Dutch East Indies. Roosevelt further antagonized Japan by freezing all of the Japanese assets in the United States, supplied financial aid to Nationalist China and military aid to the British in violation to the existing international war rules. On Dec 4, three day prior the attack on Pearl Harbor, Australian intelligence warned Roosevelt of a Japanese task force moving towards Pearl Harbor. The attack resulted in the deaths of 2,400 American soldiers and resulted in the entry of the United States into the war. Before the attack on Pearl Harbor, 83% of the American public did not want to enter the war. After the attack, one million men volunteered for the military service. The United States had emerged from the Second World War as a dominant world power both militarily and economically. It had grown wealthy selling weapons and lending money to both sides of the war. In 1945, the U.S. produced half the world's coal, two-thirds of the oil, and more than half of the electricity. The U.S. manufacturing industry was able to produce great quantities of machinery, including ships, airplanes, vehicles, armaments, machine tools, and chemicals. In addition, the U.S. held over 65% of world's gold reserves and was the sole possessor of the atomic bomb. Delegates from 44 Allied nations gathered at the Mount Washington Hotel in Bretton Woods, New Hampshire for the United Nations Monetary and Financial Conference during the first three weeks of July 1944. The purpose of the conference was to establish the rules for commercial and financial relations amongst the world's major industrial states. The agreements signed at this conference became known as the Bretton Woods Monetary System. The Bretton Woods Monetary System was basically a pegged rate currency exchange system with the U.S. dollar functioning as the underlying currency. All countries would peg their currency to the U.S. dollar and would buy and sell U.S. dollars to keep the market exchange rates within a trading band of plus or minus 1% from the original ratio. The U.S. dollar would be convertible into gold at a rate of US$35 per troy ounce. In effect, the U.S. dollar took over the role held by gold under the previous international gold standard financial system. The U.S. has enjoyed an enormous advantage of such a system because they are the only entity legally capable of creating more of the reserve currency, that being U.S. dollars. Other nations were forced to buy large amounts of U.S. dollar reserves to maintain their currency within the trading band. On June 4, 1963, John F. Kennedy signed a virtually unknown Presidential decree, Executive Order 11110, a mere four months before his assassination on November 22, 1963. This decree returned to the U.S. Federal government the Constitutional right to create and "to issue silver certificates against any silver bullion, silver, or standard silver dollars in the Treasury." As a result, US$4,292,893,815 of new "Kennedy Bills" were created through the U.S. Treasury instead of the Federal Reserve System. In 1964, Kennedy's successor, Lyndon B. Johnson, stated that, "Silver has become too valuable to be used as money." The Kennedy bills were removed from circulation. Below are examples of the $2 and $5 dollar denominated "Kennedy Bills" (also known as "Red Seal Bills"). Note the 1963 date and words "United States Note" at the top instead of the familiar "Federal Reserve Note" wording. (Click on image to enlarge). The importance of these bills is not to be underestimated. The regular Federal Reserve Notes are created through the Fed who exchanges them for an interest-paying government bond. These "United States Notes" were directly created through the U.S. Treasury and backed by the silver held there. There was no interest to be paid on these bills by the government (or more correctly, by the tax-payer) to the Federal Reserve. U.S. involvement in Vietnam began as far back as 1954, but the "official" position was that no combat missions were conducted until late 1963. The official declaration of war on Vietnam in 1964 came as a direct result of two alleged attacks on two U.S. destroyers by North Vietnamese PT boats in the Gulf of Tonkin. A report released in 2005 by the National Security Agency indicated that the second attack likely never occurred. North Vietnamese anti-aircraft missile systems could not be bombed until they were known to be operational. No enemy could be pursued if they crossed into neighbouring Laos or Cambodia. Critical strategic targets could only be engaged unless initiated by high military officials. Pilots were restricted from attacking enemy airfields, SAM sites, power plants, naval craft in some areas, a 30 mile area around Hanoi, and a 10 mile area around Haiphong. In many instances up until early 1967, U.S. pilots were not allowed to engage enemy fighters unless they themselves had been attacked first. These rules of engagement were televised in North Vietnam thus enabling them to strategize their war tactics around them. In 1966 Johnson lifted trade restrictions against the Soviet Union knowing full well that the Soviets were funding up to 80% of the North Vietnamese war supplies. David Rockefeller financed factories in the Soviet known to manufacture military equipment for North Vietnam. The war in Vietnam was never meant to be won. It was intended to be sustained for the benefit of the central bankers who lent money for the war effort. The war resulted in the deaths of 58,000 U.S. soldiers and three million Vietnamese. Escalating costs from both the Vietnam War and domestic social programs resulted in ever increasing amounts of U.S. dollars being printed. In the early 1970's, the United States as a whole began running a trade deficit for the first time in the twentieth century. Foreign owners of U.S. dollars began to question the ability of the U.S. government to reduce budget and trade deficits. Increasingly, foreign nations, in particular the French under Charles de Gaulle, began to send the U.S. dollars earned by exporting to the U.S. back to be redeemed in gold as legally entitled under the Bretton Woods Agreement signed in 1944. The drain on U.S. gold threatened to completely empty the U.S. Treasury. To prevent this from happening, on August 15, 1971, President Richard Nixon unilaterally closed the gold window. He made the dollar inconvertible to gold directly, except on the open market. The severing of this last link between gold and paper money meant that all the world's currencies now "floated" against one another. The result was inevitable with gold soaring from US$35 to US$195 an ounce by the end of 1974. This was the final step in abandoning the gold standard. All the central banks had to control now was the public's perception of inflation to allow them to create as much money as desired. On January 1, 1975, after 42 years, it became "legal" for individual Americans to own gold again. Anticipating the demand, many central banks sold off large quantities of their gold reserves. The effect was a decline in the price of gold to US$103 a troy ounce in eighteen months. Gold regained its previous nominal high of US$195 set on December 1974, almost three-and-a-half years later on July 1978. It then went on to new highs, hitting US$250 in February 1979, US$300 in July, and US$400 by October. The new Fed Chairman, Paul Volcker, appointed by Jimmy Carter announced a change in policy upon return from a conference in Belgrade concerning the global financial system. He announced that the U.S. Federal Reserve was switching its policy from controlling interest rates to controlling the money supply. Gold reached a peak of US$850 on Jan 21, 1980 amidst soaring interest rates. The U.S. Prime rate hit 20% in April 1980 and stayed there (with a brief dive in mid-1980) until the end of 1981. This resulted in a rush out of gold and back to U.S. dollars. 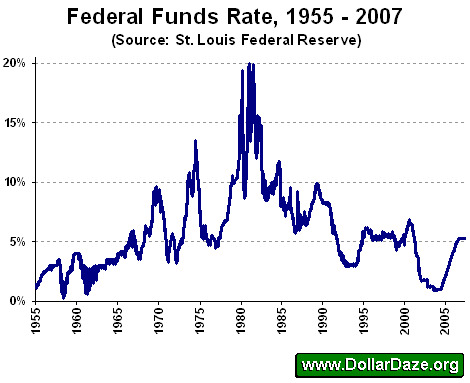 By 1982, interest rates had dropped and gold had fallen to US$296 an ounce. Investors piled both into the stock market and gold. The price of bullion reached a peak of US$510 an ounce at the end of January 1983. However, in the last four trading days of February 1983, gold fell US$105 and the Dow broke above the 1100 point level for the first time. Thus began the long bear market in gold and boom in equity markets. Further fuelling the rise in equities was the effective abandonment of the permanent debt ceiling of US$400 billion set in March 1971. By late 1982, the public debt had tripled to US$1.25 trillion. Presently, the public debt of the United States stands at over US$9 trillion. This explosion of debt led to worldwide monetary inflation as the U.S. still enjoys a de facto reserve currency status by virtue of history and an agreement made with OPEC in 1973 that world oil would be priced in U.S. dollars. Monetary inflation leads to the formation of economic bubbles wherein market speculators bid up the prices of assets to unrealistic highs. When all market participants have clambered into the market the market generally collapses when it becomes apparent that there is nobody left to buy. The Dot-com boom from late 1994 to early 2000. It is important to be aware of the fact that these booms, and subsequent busts, are not the result of free-market capitalism as commonly held. They are the direct result of monetary manipulation by central banks no different in principle than Soviet-era market intervention. The current Federal Reserve banking system is modeled after the European central banking system Americans revolted against during their War of Independence. Every dollar created under the present monetary system does not represent a tangible asset. It represents an I.O.U. from the government, and therefore the people, to the central bank. After three failed attempts, central bankers finally gained control the monopoly on the issuance of American money with the creation of the Federal Reserve in 1913. There are two unavoidable results of the Federal Reserve System: (1) devaluation of the dollar and (2) accumulation of debt. 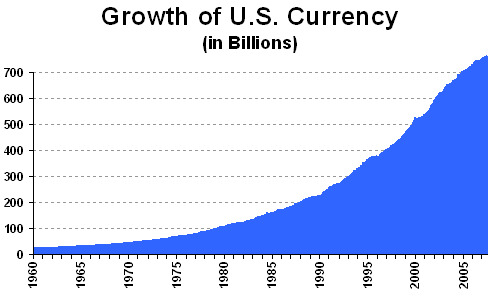 Since the establishment of the Federal Reserve, the U.S. dollar has lost over 95% of its purchasing power. Rising prices is not intrinsic to free-market capitalism. It is a monetary phenomenon caused by increasing money supply. Money, like anything else, is subject to the laws of supply and demand. The more abundant the money, the lower its value. If the amount of money were to remain constant relative to population, we would see a general decrease in the prices of goods as technologies and transportation efficiencies improved. This would be a boon to consumers. Consider the rapid spread of telecommunications and computers, two industries where technological improvements have actually been able to outpace the price escalation caused by the monetary inflation of central banks. Lower prices have led to a surge in consumer usage. People don't hold onto their money in hopes of waiting for a better computer or phone. Quite often they buy a second or third one. The consumer base grows as well because for those who previously could not afford one now can do so. Despite these blatant observations, conventional economic thought believes that decreasing prices are bad for the economy because it encourages saving. It is widely held that consumer spending, not saving, is what drives the economy. This is a falsehood, perpetrated by those would stand much to gain by further and further indebtedness of the public. Savings leads to capital investment which is the real driver behind capitalism. Every dollar created is an instrument of debt lent out at interest. The extra money required to pay back the interest can only come from one place, that being the central bank. As such, the central banks must continuously increase the money supply. For the 2007 fiscal year ending Sept 30, 2007, the total interest charges to the Total Outstanding Public Debt of the United States was US$430.0 billion making it the forth largest expense after Human and Health Services, Social Security Administration and National Defense. By means of comparison, for that same 2007 fiscal year, the total revenue collected from individual income taxes was US$1,156.8 billion (see table S-8 Receipts by Source on page 169 of the Budget for the Fiscal Year 2008 here). Thus, the equivalent of a little over 37 cents of every dollar the U.S. government collects under the Sixteenth Amendment goes towards paying the interest on the national public debt. This amount doesn't include any repayment on the principal, nor does it include any State or Local public debt. Not a bad rate of return for the Federal Reserve which literally creates the money that indebts the nation out of nothing but the want thereof! The current monetary system uses questionable practices on both moral and legal grounds. Monetary inflation erodes the wealth of citizens. Fractional reserve banking enable banks to fraudulently lend out more than they have. Debt is incurred every time new money is created. This debt must is inherited by future generations. Below are three measures that would establish an honest monetary system. The U.S. government must begin by first balancing the annual budget and then begin reducing the public debt. This would reduce the tax burden and ultimately allow tax dollars to be spent only on services requested by the people and not to banking agencies. (For a discussion of to whom the debt is owned to click here). A hard currency should be introduced that competes against Federal Reserve Notes. Each of these bills would be backed by a defined quantity of a hard asset, such as gold, that are fully convertible at any time. Such a system could be comprised of bills representing a number of grams of gold. There should be no legislation regarding the exchange ratios between gold and any other commodity or fiat currency. The free market should determine what the price of silver or Euros is in gold. Borrowers and lenders should negotiate an interest rate on any lending arrangement using the hard currency. Lastly, there should be no law requiring that people must use this new currency. Legal tender laws are needed to make people accept a bad currency, not a good one. This hard currency would require banks to store gold in their vaults. Any bank without gold would be unable to issue out the hard currency either in cash or as a loan. In essence, the hard currency is a paper receipt convertible on a 1:1 exchange basis with gold. The gold is the money; the paper receipt is merely a representation of the physical metal. The practice of fractional reserve banking should be criminalized, as is any other form of fraud. No business should be able to lay claim to assets they do not have, let alone lend out these assets and charge interest on them. This would eliminate the phenomena of bank-runs whereby panicked depositors line up to withdraw their assets for fear that the bank is insolvent. A bank should be able to lend out $10,000, only if it has $10,000 to begin with. With the present system, banks can lend out multiples in loans to what they have in reserve deposits. Within these ratios a financial institution may legally lend out up to $8.5 million without any reserve or $45.8 million with less than $1.4 million in assets. The most significant expenses facing people are: taxes, interest and inflation. The relative significance of each of these costs depends upon one's socio-economic status. Each of them is further exacerbated by the current fiat monetary system of centralized banks and the industry's use of fractional reserve banking. The measures described above would ensure price stability, preserve wealth and reduce debt. 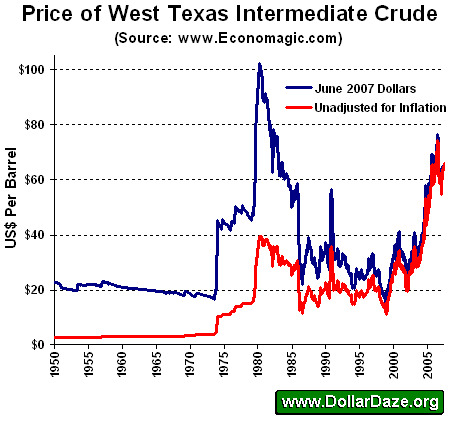 Price stability can be seen in the following chart that shows the price of oil from 1950 to the present day. Note the marked change in the price of oil before and after Nixon took the U.S. dollar off the gold standard when he closed the gold window in 1971. The reason for the price stability under a gold standard is that the relative value between commodities fluctuates much less than their prices in fiat currency. Personal wealth would be preserved under an honest monetary system. Under a fiat monetary system, newly created money diminishes the value of those already out in circulation. It is no different from theft, albeit an insidious form that the victim doesn't even realize. The amount of gold being mined inflates the gold supply by about 2% per year. Much less than the estimated 12-15% money supply growth rate of fiat money. Future generations would be spared the burden of a large debt for obligations promised by a previous administration. To do this, would require that we begin living within our means. Perhaps this is the most serious roadblock to us ever having an honest monetary system. Mike Hewitt is the editor of www.DollarDaze.org, a website pertaining to commentary on the instability of the global fiat monetary system and investment strategies on mining companies. Disclaimer: The opinions expressed above are not intended to be taken as investment advice. It is to be taken as opinion only and I encourage you to complete your own due diligence when making an investment decision. You must be logged in to comment an article 8000 characters max.